If there’s one pet peeve the majority of business owners share, it’s not getting paid on time by clients. Late payments mean you jeopardize your ability to pay your own vendors – and even employees – on time, and it stunts your ability to grow your business. There are remedies to this problem, though. Try one (or several) of the following strategies to get paid on time. You can hardly blame your clients for paying their invoices late if you don’t have clearly established guidelines in place. Make sure you have a visible due date on each invoice, as well as your payment terms (“net 15”) where clients can’t miss them. If you’re just now planning out your accounts receivable strategy, send an email to all clients letting them know the plan. When you onboard new clients, make sure due dates and payment options are outlined in your agreement. That way, you have something in print to refer to should a client still drag her feet on paying you. Who doesn’t like saving money? By giving clients the opportunity to shave off a little from their invoice, they may be more likely to pay on time, or even early. The amount doesn’t have to be much; even 2 percent is enough to incentivize some people to pay early. Just be sure to establish strict deadlines for them to qualify for that early discount. It’s worth it for you to take a slight cut in what you receive simply to get your money faster. The opposite strategy to the early discount is the negative reinforcement of the late penalty. If getting a discount doesn’t motivate people to pay early, the shame (and cost) of having to pay extra if they pass your due date should keep them from delaying your payment. Again, 2 percent of the invoice is probably sufficient to get them to take action. 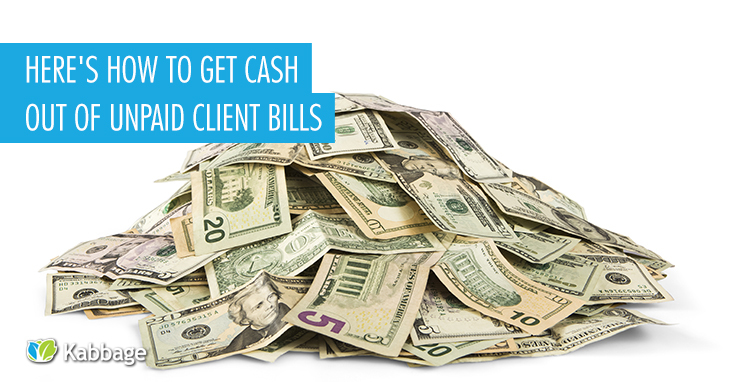 The easier it is to pay you, the quicker your clients will pay. If you’re tired of the old “the check is in the mail” excuse, use an online payment processing tool that will allow you to accept credit or debit cards online. Clients can pay as soon as they receive their digital invoice, and the money is transferred to your business bank account within a few days. PayPal is a popular payment platform that many people are already familiar with using. If it’s as simple as logging into their accounts to pay you, there’s no excuse for taking weeks to do so. Even though some credit cards charge more to process payments, such as American Express and Discover, it may be worth the fee to add them to your payment options. If a client has an American Express card and prefers to put his business expenses on it, you’ll make it easy for him to pay you if you accept his preferred method of payment, rather than forcing him to scramble to find another payment option. Rather than chasing down elusive clients and demanding payments, you can factor your invoices. Factoring essentially provides you with a cash advance of the amount of a given invoice, plus a small service fee. Once you receive the payment you pay back the factor loan. This tends to be a better option if you have a steady stream of invoices that need to be factored, rather than just one or two. If you get the sense that you’ll never collect on an invoice without serious muscle power, turn those invoices over to a collections agency. They’ve got the skills to get late-paying clients to shell out what they owe. They will buy your past-due invoices (usually 90 days past due or more) for a fraction of what you’re owed, but still: some money is better than none. If you’ve tried other strategies to get your clients to pay on time and are at your wit’s end, having working capital could be your best option. By having enough money in the bank to pay your accounts receivables, order inventory and keep your business running smoothly, you don’t have to worry about those delayed payments. A working capital loan gives you the amount you need – anywhere from $2,000 to $100,000 – when you need it. If you take a small loan out and repay it quickly, you can always access additional funding as your cash flow crunches up again. Hopefully this cash flow hurdle is temporary, and you will be on your way to on-time payments in the near future. With a clearly outlined payment policy as well as penalties for late payment (or rewards for early payment), your clients should respect your guidelines. In the event that a client is having his own financial troubles, though, find a way to work out a payment plan. It’s better to keep the client and get a little money each month than to push him away with your ironclad payment policy if he’s in a financial pickle. Which of these strategies have you tried to use? Did they work? Let us know in the comment section below.